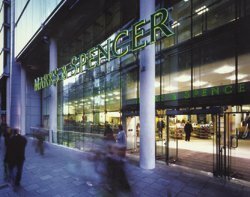 Marks & Spencer is pressing ahead with major technology-driven change projects, despite voicing caution over the economy as it announced its annual results. Marks & Spencer is pressing ahead with major technology-driven change projects, despite cautiousness over the economy in the second half of the year. The retailer announced its results for the 52 weeks to 27 March today, with a 4.6% rise in profit to £632.5m - just ahead of analysts' average predictions of £628m. "We have had a satisfactory start to the first quarter. Consumers are naturally concerned about any impact of the Budget on 22 June. We therefore remain cautious about the outlook for the year ahead," said M&S group chairman Stuart Rose. Total capital expenditure at the group for the period reached £389m. Investment in IT and supply chain totalled £194m for the year to 3 April, compared with £188m invested during the year ending 28 March 2009. Over the last fiscal year, the retailer said some £35m of savings have been generated through warehouse consolidation and the implementation of "a number of efficiency projects". Both IT and logistics are led by chief information officer Darrell Stein. Last year, the group set out the main technology and supply chain requirements as part of its Project 2020 and towards the end of last year the group sought to "accelerate the pace of activity to fundamentally transform the way M&S does business". In addition to its recently-opened Bradford warehouse, M&S will open a second site in the Midlands which will be a combined national distribution centre and a dedicated e-commerce facility, which will be operational in summer 2012 if planning permission is granted. Improvement in systems has also taken place to improve supply chain processes. For example, an enhanced stock management system is being rolled out and to provide more accurate real-time stock level information. A new point-of-sale system, intended to deliver cost efficiencies and better customer service, is going to be implemented to all stores and the project is expected to complete in 2011. Additionally, the retailer is "well underway" with a company-wide SAP roll-out, which will underpin its operations. According to M&S, the first phase of the implementation has been completed successfully in the food division and the roll-out has continued into general merchandise. Building a strong multichannel capability is also part of the firm's ongoing technology strategy. Recent work on the M&S website is part of that process and includes the introduction of catwalk videos, a more efficient search facility and stock availability information. On other customer-facing initiatives, M&S claims to be the first high street retailer to deliver mobile shopping functionality following the launch of its mobile-enabled website earlier this month.